Weight in this length: 8lbs 2oz. Mostly tele or parallel: Depends on how my legs feel! Now that that's out of the way... I only got to spend a day on these at Smuggs in about 5" of fresh snow. Once the snow starts falling a bit more, I'll have them in the BC in no time and report back. After a bunch of research and contemplation, I got these to supplement my Sentinals in my quiver. They are exceptionally quick turning and nimble, yet as long as there's a little snow on the ground, they are still stiff enough to be stable with some speed. They do get pretty skittish on ice, but still hold an edge, and I never felt like I was losing control. The huge thing I noticed about them is how well they do quick pivot turns. I'm not the most adept tree skier, so the 25+mph my Sentinals wanted before I could get them to float enough to pivot just wasn't good enough. These things float so well even under my enormous posterior that I could do incredibly tight, low speed turns. The fishscale pattern climbs very well. I only have Karhu 10th Mountains to compare them to, and I would say climbing performance is comparable. The glide isn't particularly good, but I can't expect much glide out of a 112 under foot ski. All in all a fantastic ski! I'll report back more as I spend more time on them. Again, I'll post more once I put these skis through their paces! Ok, I've had some more time on this skis. one day of good "towncountry" and one more day of soft in bounds. I can't say enough about these skis. Their soft snow and deep powder performance is downright incredible. 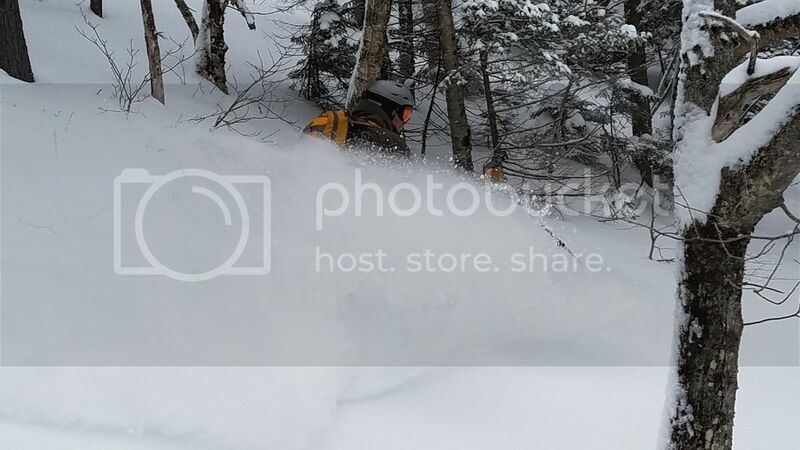 I had them in 30" of powder and was in complete control, and then took them to the trees of Stratton the next day and confirmed the lightning fast turns and incredible response. The only problem I noticed was with the bindings. The freedoms ski beautifully. In fact, they are exactly what I look for in a BC binding. Laterally stiff without having that resistance that the normal NTN's have. The problem is the tour mode pull tab. Once some snow gets stuck under there, they like popping into tour mode during a turn. I'm going to research some and see if there's some way to fix this. I might have to get creative. Ok, I've had a real BC trip on these skis now. I can't imagine a better ski for tight tree skiing in variable snow. I took a trip down something I regularly fell down, and I not only stayed on my feet (except for that one little fall) I felt completely in control and spent the entire trip enjoying the run instead of trying to not die. I had better luck this time with the tour mode, but the heel risers did collapse on me once. We'll see how that goes in the future. Last edited by flyingcow on Tue Mar 05, 2013 8:53 pm, edited 2 times in total. I'm skiing 181 Chargers this year as well. I haven't bothered to try them on anything firm as that's not why I bought them. However, in December when we had lots of fun snow, these were a blast. The rocker makes anything variable just feel real smooth. They bounce down the hill, due to the camber and stiff tail and overall they turn very quickly. I tried them in bumps one day that Magic Mtn. was closed and we skinned up. They were not great there as the width caused them to clack together quite a bit (steep, firm bumps are not what they were made for). I will keep these for powder days and earning turns as the weight (with NT Bulldogs) is quite manageable. I did a bit of an Edit above. Hey Pete, you already have NTN boots with tech toes, why no try the TTS? Nurse Ben wrote: Hey Pete, you already have NTN boots with tech toes, why no try the TTS? No Tech Toes in the Prophets. The Vectors are the narrowest at 97-98mm. The Chargers are 110-112mm waisted. The TTS still seems a bit kludgy to me, but I'll keep my eyes open if I make the jump to Scarpa in a few years for the next set of boots. Just received my new Charger BCs in the mail. Very exciting day! Not mounted yet so the only part of a review I can do is the weight. It seems they weigh exactly what Voile says they do: 7lb 13oz. Don't they know they are supposed to fudge? Oh ya, these are the 13-14 season skis and they are ugly! Good thing I will only have them in the b.c. where no one will see me. a couple questions...Has the issue of snow build up under the Freedom pull tab resolved itself? did you do anything to fix it? I'm considering a transition to NTN when I blow through the bellows of my T1s. Already replaced the scuff guard once and I'm close to cutting through. Can you expand on your experience with the Freedoms. Also considering the Charger BC and was wondering if you ever wished for 10 more cm. The weight guideline from voile puts us both in the 191cm category. a couple questions...Has the issue of snow build up under the Freedom pull tab resolved itself? did you do anything to fix it? I never did anything about the snow buildup. Honestly, I just got better at locking it down, and never really had the problem again. Can you expand on your experience with the Freedoms. These are the best bindings I've ever skied for heavy tele (and I've skied a lot of bindings). I think they give me the "softer" feel that I was looking for after I transitioned from Pos. 4 HH to my NTN Freerides. The tour mode switch is so friggin easy, I make my AT friends jealous when we are in anything but sustained steep terrain. So I can only speak for myself here, but there has not yet been a day that I wished I had the 191s. I don't get the too short feeling until I have them up in the 40+mph range. I didn't buy them for that (but have tested them there...surprisingly good). I use these for trees and backcountry trails where I'm never going too fast, but I often need to turn quickly. They can do a lightning fast smear in deep powder, and hold there own on the firmer stuff. Not the best for ice, but in the BC, this has been less of a problem lately . I have mine mounted boot center as well.